Shamrocks, Pots of Gold, and green, green, green! Kindergarteners know how much fun St. Patrick's Day can be, even at an early age. Help them make celebrating Ireland's world famous holiday with these year one St. Patrick's Day worksheets and printables. March 17 is a great time to start thinking about Spring worksheetsFor your youngster as well. How many leprechauns do you count? Have some St. Paddy's Day fun with this picture counting worksheet. Little leprechauns will use those maths skills to count up the gold coins in this St. Patrick's Day worksheet! Get into the St. Patrick's Day spirit with a colour by number coloring page. This St. Patrick's Day rainbow maze will get your child excited about learning. Try this St. Patrick's Day rainbow maze with your little leprechaun. Celebrate St. Patrick's Day with this coloring page, which features a bounty of clovers bursting from a hat. Counting, drawing and coloring are rolled into one worksheet this Saint Patrick's Day! Give your child counting practise with this engaging St. Patrick's Day maths worksheet. It's a shamrock dot-to-dot that might be luckier than most! 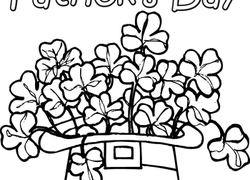 Counting practise and fun coloring are in the cards with this St. Patrick's Day worksheet. What lies at the end of the rainbow? 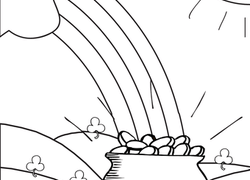 Help your child celebrate St. Patrick's Day, or any day, with this pot of gold coloring page. Let your kindergartener show someone she really cares by coloring this Irish symbol of love for a friend or relative. Your kindergartener will get counting, writing and spelling practise out of this festive St. Patrick's Day printable! Celebrate St. Patrick's Day, and help your child exercise patience, perseverance, and problem solving, with this shamrocks maze. Here's a subtraction page for little maths leprechauns to stay in the spirit of St. Patrick's Day! Did you know Celtic knots have many different meanings? colour this beautiful design in celebration of St. Patrick's Day! Hone observation skills by getting your lass or lad to find the two St. Patrick's Day leprechauns that match exactly on this printable. Get into the spirit of St. Patty's Day with this picture addition worksheet for beginners.